Too many amazing recipes – I can’t choose which one to blog about. Vegi Antipasto with Carrot and Apple Kuchen for dessert. Mix ingredients in a large bowl until well combined. This is easiest done with your hands. 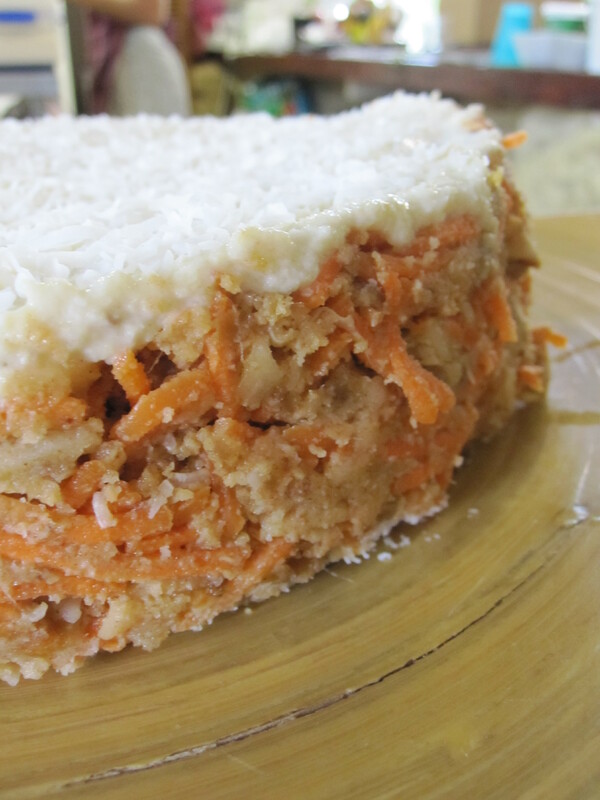 Sprinkle some shredded coconut into the bottom of a form springform pan. Pack the mixture into the pan and flatten well. In a food processor, combine together 1 cup soaked cashews, 3 Tbsp. agave nectar and 1 Tbsp. lemon juice. Smooth over the top of the carrot mixture with a spatula. Sprinkle with extra shredded coconut. Place in the fridge for 1 hour to set. To serve, release cake from springform pan and transfer to a plate. Keeps for up to 3 days in an airtight container in the fridge. Thanks Karen Bartz for showing us this recipe today in your raw food cooking class. A Recipe You Can Do Today! If you never #quit you #neverfail - just plug on. It is fabulous that we get to start each and everyday anew.